Yesterday was a day for crossing all kinds of borders. The conference I attended at the John F. Kennedy Library could not have been named more perfectly. 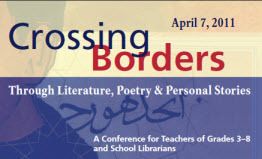 “Crossing Borders Through Literature, Poetry & Personal Stories” was the official conference title, but I couldn’t help but think how well it described my day – personally and professionally. Linda Sue Park, the Newbery-winning author of A Single Shard, was funny and thought-provoking and she made baseball references – although she’s a Cubs fan. One of the issues she spoke passionately about was the importance of writing what interests her. The spark for A Single Shard was Park’s own interest in celadon pottery – not because she thought that the world was somehow missing a book for young people about Korean pottery. I’ve always been a big fan of James Rumford’s work, but now I plan to check our library shelves to be sure he is well represented. He is one of those “Renaissance Men” who, according to Park, speaks “about 38 languages” seems to be interested in everything. He has written about, among other things, calligraphy in Afghanistan, children in Chad who build their own school each year and Ibn Battuta, the Moroccan traveller. Yesterday also included some personal boundary crossing. The conference took place at the Kennedy Library, a place where I worked for 15 years. Although many of my colleagues have, like me, moved on to other adventures, others are there and being with them yesterday was as memorable and moving as the program. At one point, I was in the conference room talking with people associated with my “new” life. And, then, I crossed a few steps and many years when I sat in an office laughing with a friend about something that happened years ago. It was the collision of those two lives on one day that caused waves of emotion. As one of my friends said yesterday, “this is where we were young together.” When I think about it, it’s reading that caused my own “border crossing.” It was knowing that I wanted to learn more and read more that caused me to leave one place I loved and find a home in a new place I love. I only hope that by teaching literature, I’m helping young people to explore their own interests and maybe cross a few borders of their own. April Showers Bring – Poetry! National Poetry Month is only fifteen-years-old. For some reason, I thought it had been around much longer, but that’s a sign of a successful program. Focusing attention on the art of poetry during April is firmly is “institutionalized” in my mind which, I imagine, is just what the Academy of American Poets would want. And this year I get to celebrate Poetry Month by meeting one of my favorite poets in the whole world – Naomi Shihab Nye. She’s speaking at a conference I’m attending on Thursday, and this morning I put her books by the door (just a few days early) so I won’t forget to bring them for her to sign. Others might line up to meet Bono or Tom Brady, but I would wait patiently for hours to say hello to Naomi. And it gets better – this month-long celebration. On April 13, Paul Janeczko is visiting Inly. As I’ve written before, Paul is the editor of many wonderful poetry books for children. Like many literature teachers, I rely on his books to help me introduce poetry to kids. A Kick in the Head: An Everyday Guide to Poetic Forms, Paul’s 2005 collaboration with illustrator Chris Raschka, is the best resource for teaching poetry – the illustrations are fun and the explanations of various forms are excellent. Janeczko’s introduction to concrete poetry, A Poke in the I, is one of my all-time favorites. This past winter, I taught a poetry unit in our middle school. Among other poems we read by Naomi Shihab Nye, was this one from her book, 19 Varieties of Gazelle. Of course, I brought figs in for the students to taste – real figs, not the kind inside of a Newton! For other fruits, my father was indifferent. weaving folktales like vivid little scarves. They always involved a figtree. Even when it didn’t fit, he’d stick it in. Once Joha1 was walking down the road and he saw a fig tree. Or, he tied his camel to a fig tree and went to sleep. Or, later when they caught and arrested him, his pockets were full of figs. At age six I ate a dried fig and shrugged. “I’m talking about a fig straight from the earth — gift of Allah! — on a branch so heavy it touches the ground. We had lima beans, zucchini, parsley, beets. “Plant one!” my mother said. but my father never did. let the okra get too big. He took me out back to the new yard. sweetest fig in the world. of a world that was always his own. I am reading poetry with my middle school students. The deeper we enter our poetic universe, the more sure I am that winter is the right season to explore poetry. There is over a foot of snow outside, the days are cold and often frustrating — for example, a very nice representative of AAA just left my house after he “extricated” my car from a snow bank at the end of our driveway. But, tonight I am reading poetry written by twelve and thirteen year-old kids, and they make me smile and laugh. A few of them make me sad. I’m not sure it would feel the same in the spring. Maybe the poems of adolescence are best read in the winter. Among our lists of things that we have to cover, we are taking the time to just read. Kids bring poems they find, poems they are writing, and I always bring a few to share. Above all, I don’t want poetry to feel “hard.” I want it to be what it is – word play and another form of expression. One of my favorite poets is Naomi Shihab Nye. We’re reading lots of her poems. Today we read one of my favorites, The List. Naomi Shihab Nye is a poet and novelist who lives in Texas. The daughter of a Palestinian father and an American mother, Nye writes about what we share and about the importance of putting our common humanity ahead of geography and politics. exercised more than they did). so there wouldn’t be large gaps in his mind. He had given up frivolous reading entirely. There are only so many days. Oh, I felt sad to hear such an organized plan. into his hand at a silly moment after all? through the delectable library shelves?